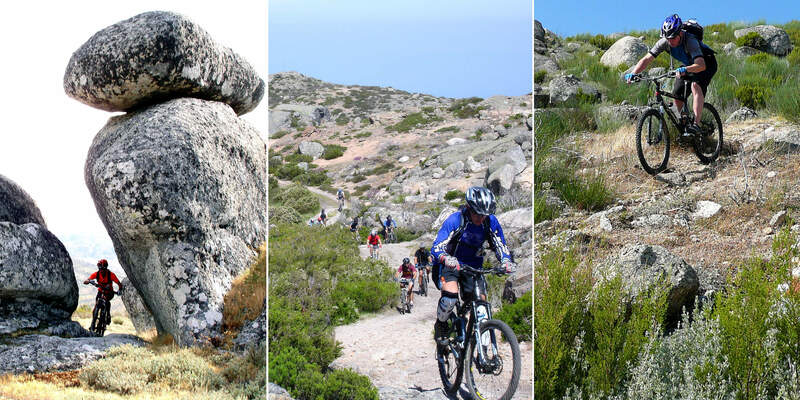 With amazing views, thousands of trails and incredible landscapes between the mountains and the Atlantic Ocean, mountain biking in Portugal is a fun and spectacular experience. The Northern region of Portugal is mountainous and green. 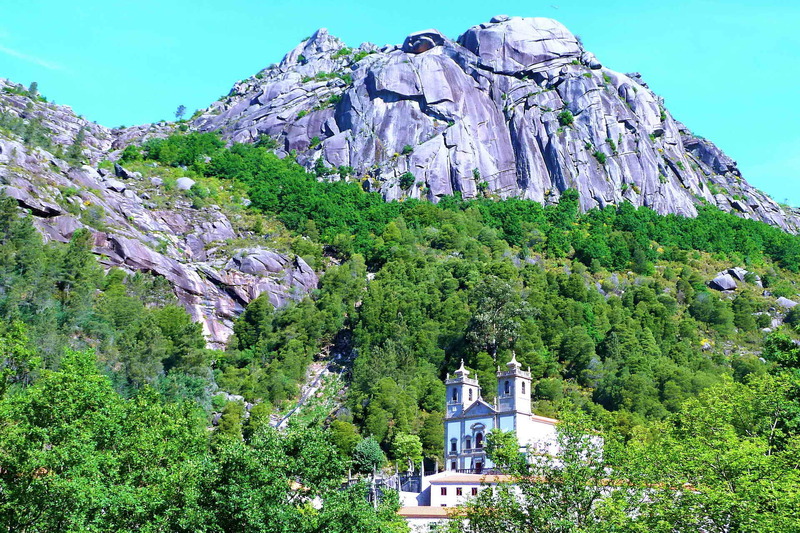 The extensive granite hills give us long ways in the Natural Parks that are excellent for mountain biking in Portugal; the Natural Park of Peneda Gerês is one of the most well-known places. The mountain trails were created in ancient times to connect mountain villages made of granitic stones. The luxuriant vegetation completes this awesome scenario. The Central region of Portugal is also mountainous, but here there is a mixture of granite and shale. The highest hills in Portugal (which is the only one that can be called mountain in Portugal) is located in the Central region of Portugal and it is mostly granite; this is the Natural Park of Serra da Estrela. In the eastern region of Serra da Estrela Natural Park there is one of the most beautiful places for mountain biking in Portugal. The trails are winding, the views are amazing with very wide landscapes; this beautiful scenery is completed by huge rocks that are scattered here and there. The trails are very old, very well preserved and this is an excellent area for mountain biking. In the western side of the Central region of Portugal the granite gives way to shale and the hills are much steeper with deep valleys and big slopes, which mean long climbs and also long descents, very funny for any downhiller. Here in the area of Lousã Hills, where the scenery is very green and with dense forests, we can find several downhill trails. Continuing towards the South of Portugal there is the vast region of Alentejo; this is the largest and less hilly region of Portugal. This is usually a dry area and the soil is mainly clay. If we go to the coast the clay gets mixed with the sand and there is a beautiful sea scenery. 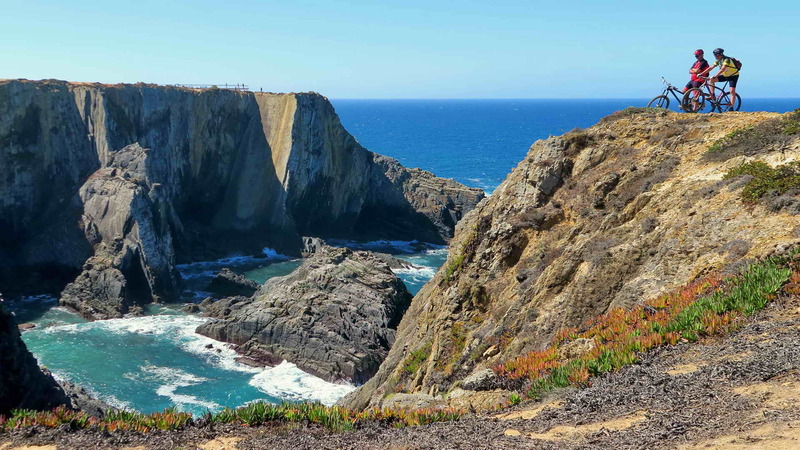 The coast is a protected area; here is the Natural Park of Southwest Alentejo and Vicentine Coast. In·land you will find cork-tree forests with winding bike trails and dense vegetation areas that look like tunnels formed by these beautiful trees.  In the south lays the region of the Algarve, after crossing the shale hills that divide the Alentejo and the Algarve. 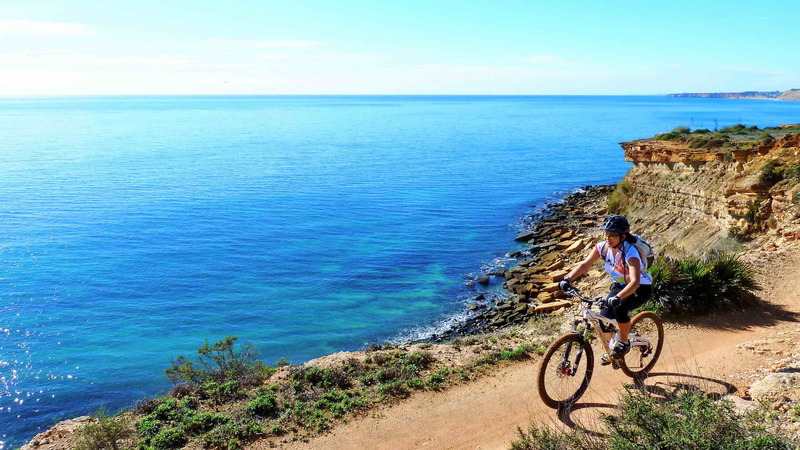 The single-tracks along the cliffs in the Algarve are always a lot of fun! 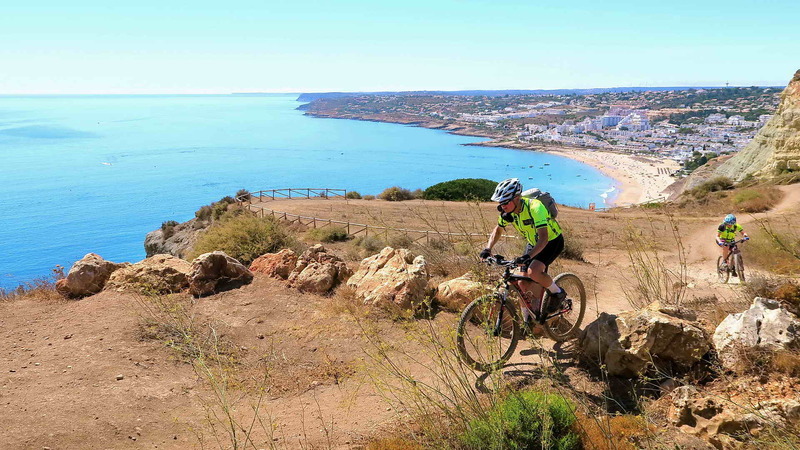 If you wish to visit Portugal with a mountain bike, I would suggest you go to the west coast south of Lisbon as far as the west part of the Algarve; this is the Natural Park of South-West Alentejo and the Vicentine Coast. Costa Vicentina is the most well-preserved coast in Europe, more than 2 million years old and it is far from the urban centers and resorts. In this vast region which includes part of the Lisbon region, the west coast of Alentejo and the west coast of the Algarve there are three Natural Parks. PortugalBike Mountain Bike Tours – “Cork Trees & The Algarve Wild Coast” or the shorter version “The Algarve Wild Coast” – cover this coastal area that is classified and known as Rota Vicentina (The Vicentine Route) or Trilho dos Pescadores (The Fisherman’s Trails), and takes you to the south-western most point of Europe: Cabo São Vicente (Cape Saint Vincent). 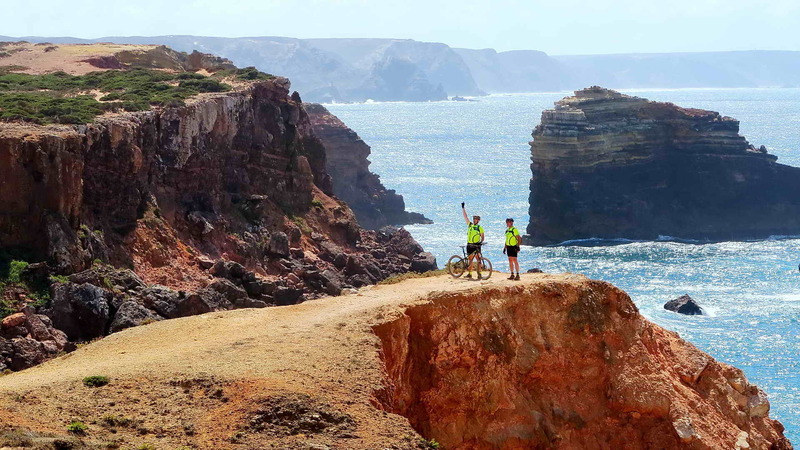 9-day mountain biking tour from Lisbon to the Algarve along the most well-preserved coast in Europe. 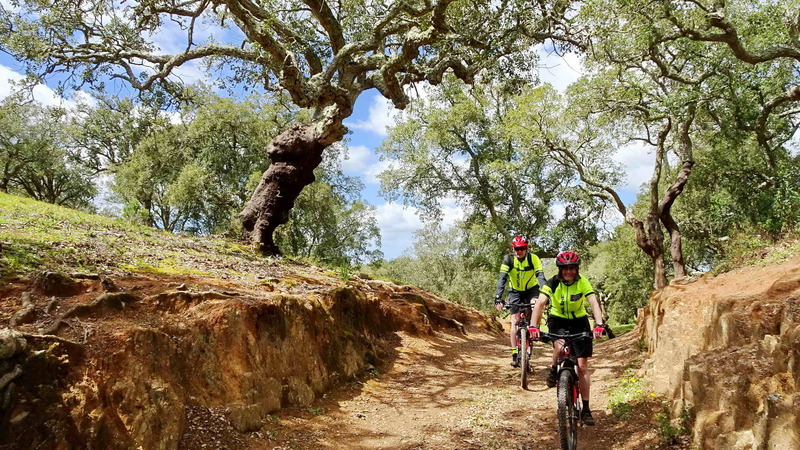 These two tours are maybe the best mountain bike tours you can do in Portugal, because they are the most scenic, with dazzling views over the blue sea and the paradisiacal beaches and the longest tour also crosses the famous cork-oak tree forests. The long single-tracks we cycle along the cliffs were once used by the fishermen and take us along the Portuguese Atlantic Coast. 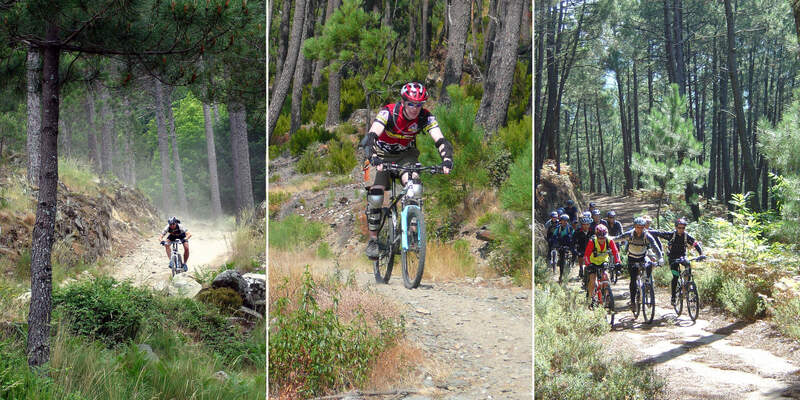 This is the best mountain bike experience in Portugal. When you ride your mountain bike in the forest you feel immensely free! You really feel you are within Nature and you feel connected with this wonderful planet Earth! You can breathe fresh air and you feel different aromas; you can hear the silence or the wind up in the trees, …and all the other wonderful sounds Mother Nature offers us! 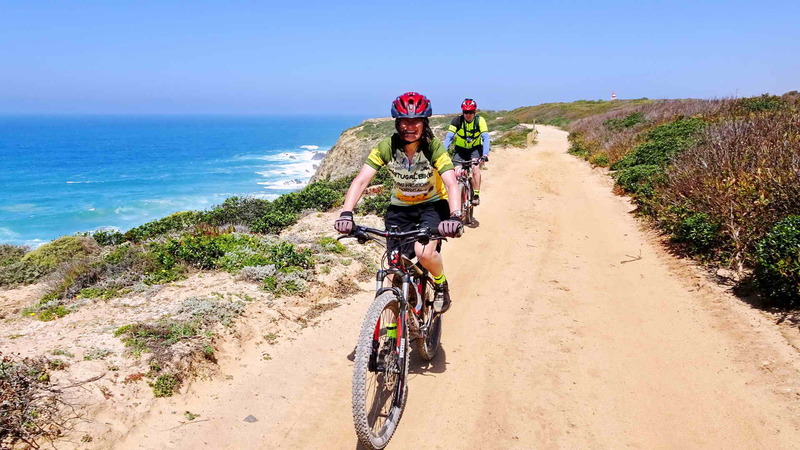 You can experience this and also feel the smell of the sea!… You can contemplate the vast blue sea and cycle along the cliffs and the vast forests of Portugal; feel a piece of Heaven on a mountain bike tour in Portugal! I am sure you will keep these amazing experiences in your memory for ever!